Not everybody recognizes it, but we all come into contact with chemicals every minute of our lives. Even the air that we breathe is made up of a mixture of chemicals. 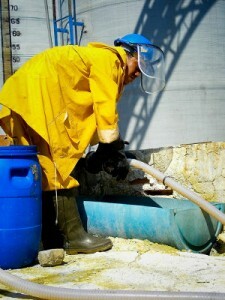 Chemicals are what the world is made of and it is inevitable that people sometimes suffer harm from chemicals. This can happen at home, at work or when we are out and about. Due to health and safety legislation in operation at industrial and construction workplaces chemical injuries account for only one in forty reported workplace injuries. But consumer injuries are as numerous as industrial ones. The organs most often affected by substance related injuries are the skin and the respiratory system. Skin injuries are at least twice as numerous as respiratory injuries. But the number of legal actions for recovery of damages arising from skin injuries and respiratory injuries are approximately equal. This may be related to the greater level of distress experienced by those suffering from respiratory injury. The numbers of both of these major categories of chemical injury are widely believed to be under-reported. People who suffer from these problems commonly change to another occupation without reporting the chemical injury problem which they have suffered. Skin injuries include dermatitis: both allergic dermatitis and non-allergic contact dermatitis. Skin injuries also include so-called chemical burns caused by corrosive substances, harde3ning and cracking due to solvent contact and injection injuries caused by contact with pin-holed hydraulic piping. Respiratory injuries include amongst others: sensitization resulting in allergic asthma, provocation of pre-existing asthma, inflammation of the upper nose and throat, and Reactive Airways Dysfunction Syndrome. Toxicology is the study of the harmful effects of substances. A definitive statement by Paracelsus dating from the late middle ages is: “All substances are poisons: there is none which is not a poison. The right dose differentiates a poison from a remedy.” The most important addition that has been added to this has been the role of timing of the absorption of the poison. The harmful effects of substances which are classed as “Normal toxic effects” are dose related. If the dose which is administered is large enough every person exposed will experience the effect. If the dose which is administered is small enough none will be affected. With regard to any particular toxic effect there is typically a low threshold dose below which the effect does not appear or at least below which it is not currently detectable. There are also toxic effects which are classed as “Abnormal toxic effects”. These effects involve the immune system. Important categories are respiratory allergic reactions and allergic reactions of the skin. Respiratory allergy usually results in asthma or other types of respiratory harm. The other possible effects include soreness of the upper parts of the respiratory tract. An allergic reaction involving the skin typically results in dermatitis. Abnormal toxic effects result from sensitization of the immune system of the allergy sufferer. The dose required to initiate sensitization is much higher than the doses which are sufficient later to provoke an allergic reaction. Accordingly abnormal toxic effects are not dose related. Infinitesimal exposure can provoke a reaction.